“For the first time in the history of the ACP, the person who will introduce the health session speaker will get his own introduction. Let me repeat that —the person introducing the session speaker will get an introduction . Mixed martial arts (MMA) is a full-contact sport that allows both striking and grappling techniques. Participants compete while standing, as in boxing, as well as on the mat, as in wrestling. MMA is derived from other combat sports and martial arts. It is mostly regulated in the United States at the state level and overseen by the Association of Boxing Commissions. Various organizations promote the sport by signing fighters and putting on MMA events. The best known of these organizations is the Ultimate Fighting Championship —UFC. The UFC is considered the major leagues of MMA; most fighters train to be signed by the UFC. 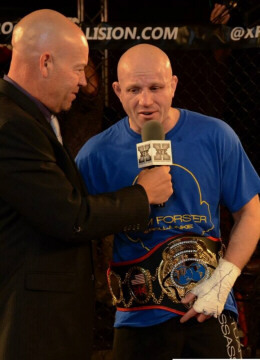 Jon Forster turned professional after winning an amateur title and is currently signed with the Cage Fury Fighting Championships (CFFC) promotional organization. 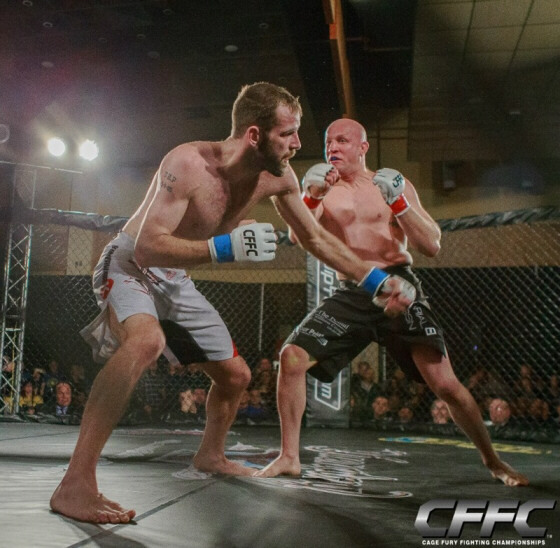 On Feb. 28, Jon won his first professional bout by unanimous decision. Recently, I sat down with Jon and discussed his actuarial and MMA careers. AL: What is your sports background? JF: I wrestled for Buena High School in Buena, N.J., where I was a two-time state placewinner. I received a wrestling scholarship from Rutgers University. I wrestled for Rutgers and was ranked as high as 14th nationally. I was also a two -time team captain and am still ranked 5th in Rutgers history with 110 wins. AL: Did you start your actuarial career after graduating from Rutgers? JF: After college, I attacked an actuarial career. I started out with Benecard Services and was in a management-level position by the end of my second year there, eventually becoming the Director of Actuarial at the company. I then came to Independence Blue Cross (IBC), where I brought the Medicare Part D bid pricing internal for the 2008 and 2009 bids. Very few companies were successful in doing so, and most outsourced the bid pricing to consultants. My next assignment at IBC was a move to the AmeriHealth New Jersey team, where I was responsible for a large amount of the actuarial functions. From there I moved on to become Director of Actuarial and the appointed actuary for Coventry Healthcare of Delaware, overseeing all actuarial functions including pricing, reserving, forecasting, and medical cost. A few years ago I returned to IBC. AL: Your actuarial career was going very well. So how did you get involved with MMA … and why? JF: As I moved up in my career, I also moved up on the scale —up to 210 pounds at one point. I knew it was time to make some serious life changes, and I started training in mixed martial arts. Several people I had wrestled with were having great success at the pro level. Two college teammates of mine, Nick Catone and Ricardo Romero, made it to the UFC. I’m always looking for ways to challenge myself, and MMA seemed like the best way to challenge myself both physically and mentally. AL: How do people react when they find out you are both an actuary and an MMA fighter? JF: When most people find out I’m an actuary by day and an MMA fighter by night, they state that there is a great contrast between the two. I always point out that the same traits that made me a top Division 1 wrestler in college and MMA fighter—work ethic, determination, drive, commitment, leadership, ability to learn, and ability to overcome adversity—also allowed me to be successful in my profession. . I participated in a variety of sports when I was growing up and was never the strongest, most athletic, most talented, or fastest. I do, however, have the most heart, the most determination, and a pretty insane work ethic. I couldn’t hit a baseball, shoot a basketball, or throw a football to save my life, but the skills above allowed me to place 5th twice in the New Jersey state wrestling tournament in high school and then to become a nationally ranked wrestler at Rutgers. AL: Give me an eyewitness account of your amateur championship fight. JF: I was coming off three straight dominant MMA wins and was offered an opportunity to fight for the XFE lightweight amateur championship. That’s right—lightweight, as in 155 pounds (55 pounds less then I weighed a few years prior). I was matched up against a very tough opponent who also had a very strong wrestling background and was 12 years younger than me. Very few people my age are actively competing at this level. I knew that I was up for a challenge and wanted to see what I could do. Coming into the fight, I could feel the energy in the arena. As I walked into the cage it was loud. I went out, touched gloves, threw some punches and went for a takedown. My opponent countered with a crafty roll and ended up in a good position and went on to totally dominate the round, landing a lot of shots. The fight was close to being stopped, and I really could not have lost the first round any worse. I went back to my corner and all I could think about was how hard I trained for the fight and how many people bought tickets and came out to support me. AL: Sounds like you’re describing the first few minutes of taking an actuarial exam. JF: Right, it’s a similar feeling. I knew I had better cardio than him. I also felt that I had much better skills than I had showed in the first round. I had been down countless times in wrestling matches, and I knew how to come back to win. I went back out in the second round and threw some punches. He tried for a takedown and I was able to counter and landed some big shots. We then got into a scramble and I had him in a choke, and ended up back on top, landing punches for the last minute of the round. When I went into my corner my trainer told me that since the first round was so lopsided I did not want to leave it in the hands of the judges. I went out in the third round and finished the fight via TKO in just 12 seconds. I was very happy with the outcome of the fight. Lots of hard work went into it, and I was able to display my heart and did not quit mentality. I also donate winnings of my fights to charity, so I was able to raise $1,100 for the Ashley Lauren Foundation, which helps families with children who have cancer (Editor’s note: Under amateur rules, MMA fighters are permitted to raise money through sponsorships, merchandise sales and ticket sales.). AL: Tell me more about your charitable donations. JF: I have a lot of people who support me through my fighting career, so it’s a way for everyone to be involved in a cause to give back. For three amateur fights (prior to my title bout) I donated my winnings to the American Cancer Society (approximately $2,400 in three fights). As I mentioned, my last amateur fight raised $1,100 for the Ashley Lauren Foundation. Marco Perazzo, who is one of the top MMA trainers in New Jersey, has been helping me train for my fights for a few years now. His son goes to the Elwyn Seedings School for children with autism and other developmental disabilities, so he asked that I donate the money there; I was happy to do so. Winnings from my first professional bout went to Elwyn—I was able to raise $2,700 for them. AL: What are some misconceptions about MMA fighters? JF: Let me address some of the myths and misconceptions about both actuaries and MMA fighters. Actuarial myth: Actuaries are just brainiac math geeks who spend all day working on calculations. Fact: It takes years of dedication, passing a series of very difficult exams in order to become an actuary. Therefore the profession attracts a certain type of person. In our department we have former college baseball players, hockey players, marathon runners, and musicians. I’m also always speaking with other actuaries who have unique interests. Just yesterday I spoke with an actuary who took 2nd place in a prestigious jiu-jitsu tournament. MMA myth: MMA fighters are uneducated. Fact: It takes a great deal of discipline and dedication to compete in MMA. To be successful, you have to learn many disciplines including wrestling, jiu-jitsu, and kickboxing. There are so many different positions and techniques to learn, and it takes quite the intellect to acquire the knowledge to process everything. Outside of technique there’s much that must be mastered, including nutrition, conditioning, and training. The discipline acquired through MMA is unparalleled. I train often with several successful business owners—doctors, lawyers, engineers, and people from many other professions. We even have a group of actuaries here who train in boxing during lunch in the IBC fitness center. There is a continuous learning process involved in becoming a mixed martial artist. Actuarial myth: Actuaries are only concerned with the numbers. Fact: Much like MMA, to be a successful actuary you must have a wide array of knowledge, including economics, business strategy, legal, marketing, and sales. I spend a large part of my day in meetings explaining how the financial results affect the overall business and strategy of the company’s goals. Actuaries must also be able to present and explain their findings and offer suggestions to key individuals at their company, regulators, auditors, clients, and business partners. MMA myth: MMA is an unsafe, anything-goes sport. Fact: Fighter safety is a key concern in mixed martial arts. Several rules are designed to ensure safety—no knees or kicks to the head to a downed opponent, elbows cannot go straight up and down, no strikes to the back of the head, no pulling hair (this is a non-issue for me), etc. In order to compete in a MMA competition you have to get cleared by the commission and pass a series of medical tests to assure you are in top-notch health. For your first amateur or professional fight, a reputable trainer has to certify that he has been monitoring your training and believes you are qualified to compete at that level. AL: In closing, walk me through your first professional fight. JF: I definitely felt that it was a big step up, moving into the professional ranks. My training for the fight was intense, and I knew I was prepared and ready for the test. I weighed in at a lean 145 pounds—a 65-pound drop from just a few years back. I scouted my opponent and knew that he was a very good submission fighter. My strength is usually on the ground with my wrestling background, but my strategy in this fight was to go for the knockout. I hit him with some very big shots in the first round and felt him breaking, but he was not going away. I felt I won the first round. I went to my corner and figured I would do the same in the second. In throwing very hard power punches, I left an opening for him to take me down in the second round and I got in a bad position. He was threatening a rear naked choke submission for most of the second round. I knew I lost the round. Coming into the third and final round, it was one round apiece. I knew I put the work in, and my cardio is my biggest strength, so I felt very confident coming into the third round. I went for the takedown and was able to stay on top for most of the third round, landing a lot of punches. After the match ended and the scorers conferred, they awarded me the match by unanimous decision. It felt great to accomplish my goal of winning a pro MMA fight, especially with the demands of my day job … and at 37 years old. I could not have done it without the support of my friends and family, coaches, teammates, and my extremely supportive fiancée. Art Lucker, MAAA, FSA, is the secretary of the ACP and works for INS Consultants in the Society Hill section of Philadelphia. © 2015 American Academy of Actuaries. An edited version was originally published July/August 2015 Contingencies. Reprinted by permission; not for further publication without express written permission of the Academy. Art Lucker - who has written 10 posts on Write On New Jersey. Really enjoyed this article. Thanks. I was very pleased to find this article and wanted to thank you for this wonderful read! !